This course is an introduction to performing source code review to find security vulnerabilities in web applications. The application we are going to work on is a simple PHP application that allows users to upload and download files. Think of it as a over-simplified Dropbox. 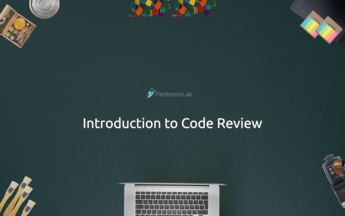 This exercise will also cover the different methods that can be used to perform code review. It can be faster than penetration testing. Some issues are really easy to spot during a code review (for example weak encryption), where others can take a lot more time (XSS for example). Compliance can require you to perform security code review (for example as part of PCI DSS 6.3.2). After doing penetration testing for a while; you want to do something different. You want to find better bugs. Some of the bugs you will find during a code review can be surprisingly hard to discover with black-box testing. You want to check if some code is backdoored (it's actually really hard to do). You want to write an exploit for a bug. Check one functionality at a time (login, password reset...). You can find a list of regular expressions to try on your code base in the GRaudit project (https://github.com/wireghoul/graudit). You don't get a lot of coverage/assurance on the quality (and therefore security) of the source code. You just know that based on your list of patterns, you couldn't find any issues. You need to know of all the dangerous functions/patterns. You end up using very complex regular expressions. This approach works pretty well for timeboxed reviews where you don't have enough time. It can also help you get familiar with a code base as part of a longer review. However, it's probably not the best way to perform proper reviews. This method provides good coverage. However, you will need a good understanding of the framework/language used. Finally, you may end up reviewing the same function again and again if it's called multiple times. And review all the code associated with this functionality. This work especially well if you do this across multiple applications/framework as they will all have different behaviors. This approach gives you an excellent coverage for the functionalities your reviewed and will teach you what mistake people usually make for a given functionality. However, you only have coverage of what you reviewed. Finally, the more time-consuming way: just start reading the code one file at the time. A better ways to do this is to try to find weaknesses, not vulnerabilities. Then trying to see if the weaknesses can become vulnerabilities on their own or by combining them. This method is obviously the most laborious way of working but it brings excellent coverage. It's crucial to keep good notes when using this approach. It’s going to take time (especially early on) but the more code you review, the easier it gets. Make sure you create a snippet with the function/class/method to test its' behavior. It will be convenient for your future reviews. To test it, you need to run it locally and try to find some edge cases that the developers may have missed. For this exercise, you have a really simple web application. We are going to go with the "Read everything" approach as there isn't that much source code to read. Then, try to see if these weaknesses can become vulnerabilities. Either on their own or by combining them. Before reading any further read all the source code of the application and try to find the issues by yourself. Make sure you keep notes. A modern web application should store all secrets outside of the source code of the application. During deployment, the secrets and credentials should be injected inside the application (via environment variables or configuration file). This limits access to production secrets/credentials for developers. .git: this can be used to rebuild the full source code of the application. deploy.sql: this contains the database password in clear text and the hashed admin password. These files should not be in the web root of the application. You can see that the application uses md5 to hash passwords. Furthermore, the hashing is done without any seed. Finally, the hashing of the passwords is done by the database (as opposed to the application). This means that customers' password are likely to end up in the database logs or get transmitted in cleartext between the database and the application. The application should use scrypt, bcrypt or PBKDF2 to store the password. However, $error is not under user's control. Therefore, those are only weaknesses, not vulnerabilities. They should still get fixed to future-proof the application. As $_SERVER['PHP_SELF'] is user-controlled and can be used to trigger a XSS (using a path like /index.php/"><script...). There is also another one in classes/user.php that can be triggered by registering multiple times the same username for example (due to the call to mysql_error). Here we can see that none of the forms are protected by a CSRF token. This is an example of the "what is missing" bugs, you can't see it because it's not there. This code gets the list of files (scandir) in files/[USERNAME] and removes the parent (..) and current (.) directory from the list using array_diff. Nothing in this code (or during registration) prevents an attacker to use the following usernames: .., ../.., ../../.. ... This will allow her to get a directory listing of any directory on the server hosting the application. It's not the RFC way to sign JWT token. This implementation will not work with other applications. We can see that the application get three elements from the $auth variable: $h64,$d64 and $sign. Then it checks the signature $sign using: JWT::signature($h64.". ".$d64) != $sign. However, it only checks the signature if one is provided: if (!empty($sign) and.... An attacker can provide a malicious $auth variable that doesn't contain a signature. This will allow him to bypass the signature mechanism. The authentication bypass is based on a real vulnerability in the Play framework covered in another PentesterLab exercise: Play Session Injection. It's possible to create a malicious user named test","username":"admin to become admin in the application. It's trivial for an attacker to guess [USERNAME] and [FILENAME] to gain access to other users' files. The developper should ever put in place some access control or make the links impossible to guess. We already know that uploaded files are stored in the web root. We can see that the developer limits the file type users can upload to PDF. However, the regular expression is missing $ to match the end of the string. It's possible for an attacker to upload a file named exec.pdf.php. As the file's extension is .php and the file is in the web root, it will get executed when accessed by the attacker. This exercise showed you how to perform your first code review to find potential security issues. I hope the course provides you with enough information and the methodology to get started. As always with security, practice makes perfect. Try to regularly review some code: changes introduced to fix a CVE, applications you're using everyday, applications in a weird language... Now it is time to apply what you just learned! Did you enjoy this exercise? Make sure you check out PentesterLab PRO and PentesterLab PRO Enterprise to develop your skills.